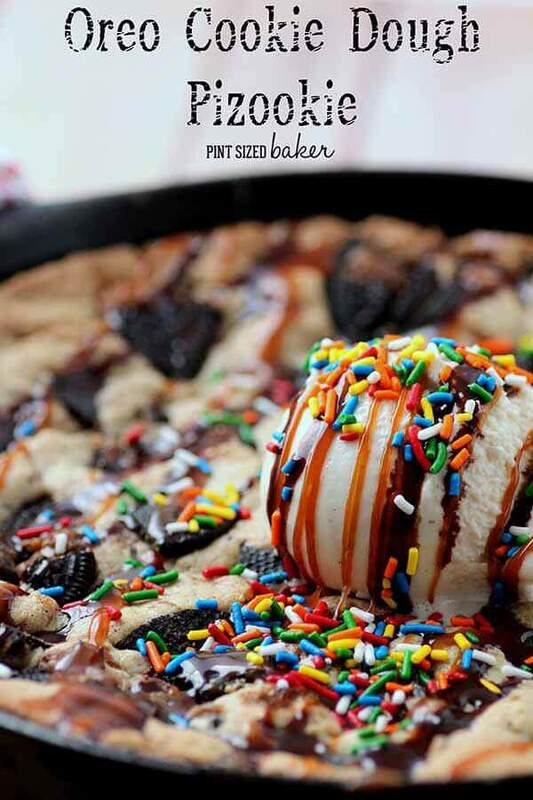 This amazing Oreo Pizookie is loaded with Cookie Dough Oreos, but you can use your favorite cookie flavor! 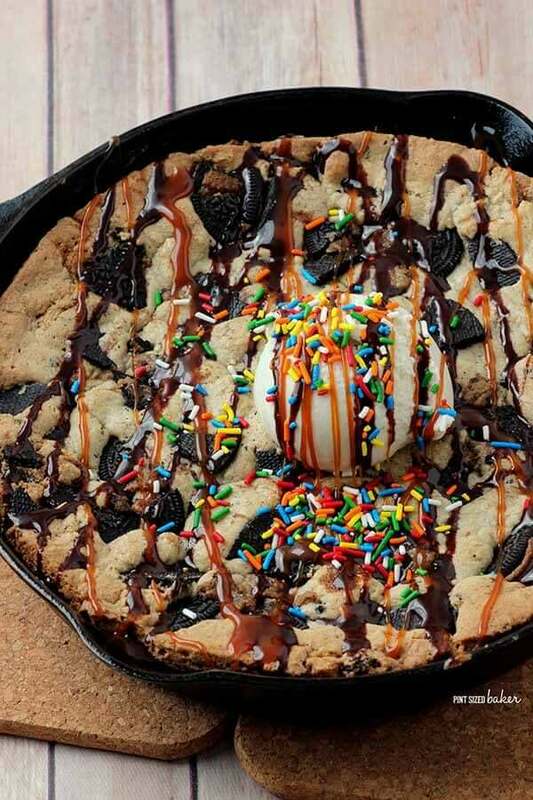 An amazing giant cookie baked in your skillet! The kids are gonna love this! I totally indulged with this Oreo Cookie Dough Pizooki! TOTALLY! It’s basically a gigantic cookie that was made with Oreo pudding mix, crushed Cookie Dough Oreos and a huge scoop of ice cream on top. Oh, and don’t for get the chocolate sauce, cramel and sprinkles! Gotta have sprinkles! The cookie dough Oreo’s are seasonal, but you can substitute your favorite Oreo flavor instead. I was in love with the cookie dough flavor because I thought they tasted like brown sugar! It was unfortunate that I was home alone with this monstrosity. My husband would have totally loved this. However, once the ice cream melted, I wan’t sure what to do with it anymore. 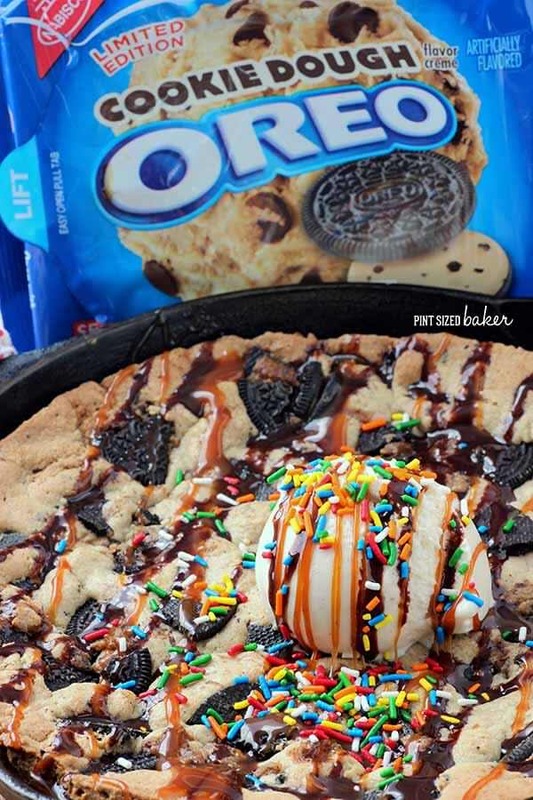 So, I suggest that you make this Oreo Pizookie for a large gathering of people to share and enjoy. Besides, isn’t that what having a great dessert is all about. Sharing it with friends and family and enjoying the bliss and happiness that comes from a decadent dessert. Just look at those Oreo cookie chunks, the beautiful ball of ice cream, and the delicious chocolate syrup that I drizzled over it. And I loved every bit that I ate. 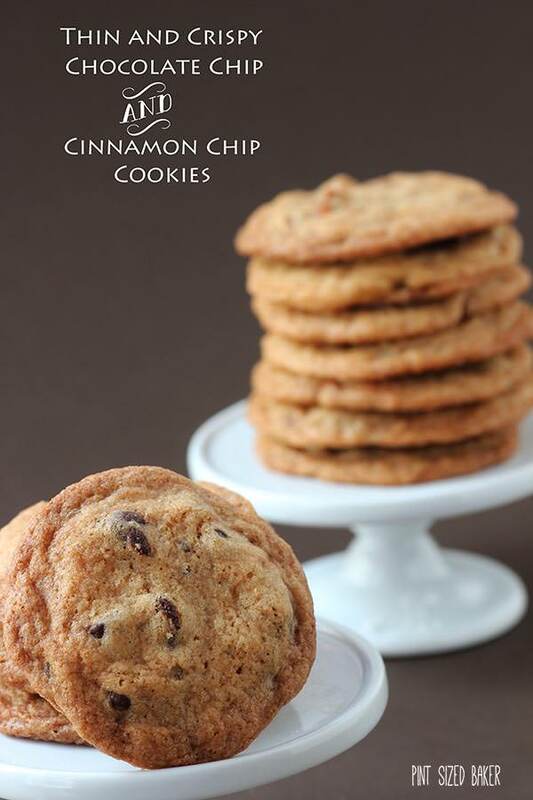 No guilt – just happiness in baking up something so yummy. Beat the butter until smooth and add the sugars. Beat for 1-2 minutes, until creamy. Add in one egg one at a time, beating until combined. Beat in the baking soda, vanilla and salt. Add the flour and pudding and mix until dough forms. 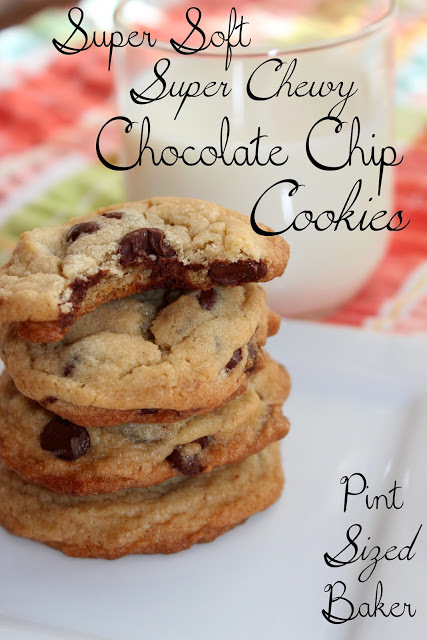 Mix in the 3/4 of the cookie chunks. Press the batter into a large skillet. Press remaining Oreo cookies on to the top of the batter. Bake for 25 – 30 minutes until the edges start to brown, but the center appears soft. Remove from the oven and cool. Top with Vanilla ice cream, chocolate syrup, caramel sauce and sprinkles. Slice up like a pie and enjoy!